I was able to find two extra XLR cables, and have been very systematically trying different tests. For example, I got out my Electro-Voice mic and plugged one of the unused cables into it and then into my Onyx. The signal is faint, but end result sounds okay. Tried the other unused cable, and similar results. Then I plugged my CloudLifter into one of the unused cables, and then ran the other unused cable to my Electro-Voice. Tried recording with phantom power off and I got a flat-line. First off, with GAIN = -15dB, and my PHONES set to 3 o'clock, I can now hear some slight static in the background, which I didn't get when my Electro-Voice was hooked up directly to my Onyx. When I listen to it, my voice sounds okay, but the static is almost as loud. I have checked that the XLRs are firmly plugged into the CloudLifter. And I have already proven that both my regular and unused XLR cables are working fine. The only thing I haven't yet tested, is this with my SM7B. Maybe the CloudLifter isn't compatable with the Electro-Voice RE50N?? To get things to where my voice would sound normal, the static is load and obnoxious!! But do you really need it? Can you really not get sufficient input level by plugging the SM7 directly into the Onyx and turning the gain all the way up? I'm with Sam - you probably don't need the Cloudlifter. Don't be afraid to turn the gain up to 50 or 60dB - you'll probably hear a little hiss if you listen carefully but the results should still be usable. James Perrett wrote: I'm with Sam - you probably don't need the Cloudlifter. Don't be afraid to turn the gain up to 50 or 60dB - you'll probably hear a little hiss if you listen carefully but the results should still be usable. First off, based on what I said above, do you think my Cloudlifter is toast? Or is my SM7B toast? I just took the Cloudlifter out of the "chain", and did "Take 1,000,000". It sounds okay, but I have to crank up the Gain to near max, and the signal is really weak. BTW, when the Gain is cranked up, what exactly are you hearing? Is that room noise or is it from your electronic components? It doesn't sound too bad for a newbie voiceover guy, but the signal is so wickedly low I am blow away!! Can I even work with a signal that small? Can you post a short sound file somewhere so that we can hear it? It is hard to get an idea of the signal to noise from a picture. I'm also not totally sure whether it is the Cloudlifter or interface that is causing the problem from the description so far. Can you feed a line level signal to the interface and does it sound OK? James Perrett wrote: Can you post a short sound file somewhere so that we can hear it? It is hard to get an idea of the signal to noise from a picture. If everything I bought wasn't broken, I would have had time to set up my webserver so I could do that?! Can I use Imgur or something else that is free and doesn't require registration - as I have too many online accounts now! James Perrett wrote: I'm also not totally sure whether it is the Cloudlifter or interface that is causing the problem from the description so far. Can you feed a line level signal to the interface and does it sound OK? I have been trying to record some more voiceovers using just my Onyx and my SM7B without the Cloudlifter. The recordings sound as good as they can being handheld, but the signal is wickedly weak. That being said, I am pretty certain something happened to my Cloudlifter. BTW, what would be a good solution moving forward as far as preamplification goes? As mentioned before in other threads, I am in a hotel while I work out of state, so I try to keep my material possessions to a minimum. I am actually ordering from B&H Photo tonight, so I welcome any recommendation fo where to go from here! Or should I just buy a replacement Cloudlifter and see if the manufacturer will give me a refund of the (2-year old, yet still new) defective one? How do you deliver your voiceovers to clients? I use Google Drive but others use Dropbox and similar services. You can also use WeTransfer for short term online storage (just send a file to yourself and then post the link they give in the confirmation email here). Soundcloud is also good for this sort of thing (and there are various Soundcloud alternatives popping up). audio_jungle wrote: BTW, what would be a good solution moving forward as far as preamplification goes? Stick with the Mackie for now. If it is working it will be fine and I still think that you shouldn't need the Cloudlifter - especially if you can get fairly close to the mic. As I said before, don't be afraid to turn the gain up. Modern preamps bunch most of the gain up at the last few segments of the gain control knob (traditional older preamps have a pad button which means the gain control doesn't have to have such a wide range). I would expect you to be using the gain control at 3 o'clock or even higher - that's totally normal and not an indication that the interface doesn't have enough gain. Resist the temptation to buy more gear until you gain more experience and have a better idea of what you really need. Acoustic treatment will be the biggest improvement for the sort of work you do and duvets strategically hung around you will make a huge difference. Given your makeshift recording location, maybe you need to start choosing hotels based on the acoustic qualities of their duvets. James Perrett wrote: How do you deliver your voiceovers to clients? I use Google Drive but others use Dropbox and similar services. You can also use WeTransfer for short term online storage (just send a file to yourself and then post the link they give in the confirmation email here). Soundcloud is also good for this sort of thing (and there are various Soundcloud alternatives popping up). I am starting a company offering many things including podcasts. Since it is about provacy and security, I'm leery of posting my voice on a site where I would lose control - at least until I come out of my shell and (maybe) become famous. Let me see if I can get a temporary webserver set up and post files there. James Perrett wrote: Stick with the Mackie for now. If it is working it will be fine and I still think that you shouldn't need the Cloudlifter - especially if you can get fairly close to the mic. As I said before, don't be afraid to turn the gain up. Modern preamps bunch most of the gain up at the last few segments of the gain control knob (traditional older preamps have a pad button which means the gain control doesn't have to have such a wide range). I would expect you to be using the gain control at 3 o'clock or even higher - that's totally normal and not an indication that the interface doesn't have enough gain. Without the Cloudlifter, I have been running the Gain around 4-5 o'clock. I turn it up until I hear hum, and then back it off until it goes away. James Perrett wrote: Resist the temptation to buy more gear until you gain more experience and have a better idea of what you really need. Good advice, but since I ultimately want to use my NT2A condenser mic, I will need more amplication that my Onyx puts out. So should I buy a replacement Cloudlifter (US$150), or get a nicer audio interface/mixer/preamp? James Perrett wrote: Acoustic treatment will be the biggest improvement for the sort of work you do and duvets strategically hung around you will make a huge difference. Ha ha. Yeah, I should probably get out my PortaBooth Plus that I bought. I just find it a PITA to set up, somewhat unstable on the mic stand I have, and the biggest setback is I have no practical way to read off of my lap or even a larger script because the PortaBooth is so small. And once I can post some voiceover samples, I am sure everyone's feedback will help immensely! Er, no? In technical terms power is the rate of energy itransfer per unit of time. It’s measured in watts, which is joules per second. Phantom “power” indicates the presence of a voltage differential - which is measured in volts. You can get power out if it, but it’s no power by itself. The distinction is not particularly interesting for a mic user, which is why the loose usage is fine (and my comment). The OP seems to favor rather precise definition and that’s what physics is there for..
Is it the size of the visual waveform that's bothering you here? You say it doesn't sound too bad but you're obviously still concerned about how it's appearing. 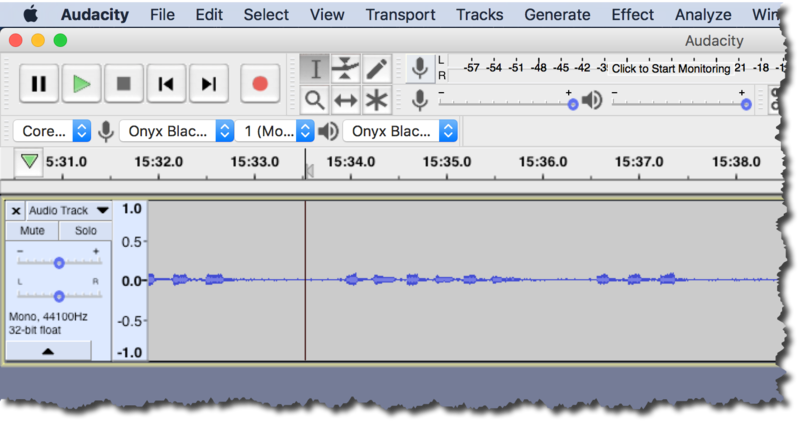 I don't know Audacity, but in Reaper, if you've recorded at a sensible level (peaks at minus 12) and you're at the default zoom setting, then the waveform will look similarly small. That's fine, just zoom in to whatever size allows you to do your editing. The key thing is the level not visual. Once you've done all your tweaking and you're ready to raise your levels for distribution you can just zoom out again. audio_jungle wrote: since I ultimately want to use my NT2A condenser mic, I will need more amplication that my Onyx puts out. No, this isn't the case -- the NT2A requires much less preamplification than the Shure SM7B. The NT2A is a capacitor mic and thus has an active preamp circuit built into it (you could think of it as having a built-in Cloudlifter). This circuit requires 48V phantom power. Having said that, there's no guarantee that you'll prefer the results from the NT2A for voiceover -- the SM7B is a classic mic for this sort of application and can be used up close, which will help to minimise the amount of room sound that gets captured. audio_jungle wrote: Without the Cloudlifter, I have been running the Gain around 4-5 o'clock. I turn it up until I hear hum, and then back it off until it goes away. Do you mean 60Hz mains hum? If you hear mains hum you have a cable problem as you should normally just hear the background sounds of the room and maybe just a little hiss from the preamp. I would also suggest setting your gain to give you the right voice level and ignore the background noise - it will still be at the same level relative to the voice with the gain turned down but you could be adding more noise from the later stages of your interface. No apologies needed. I'm as green as they come, and this may be the friendliest and most helpful forum on the Internet, so know that I'm happy to be here and learn!! blinddrew wrote: Is it the size of the visual waveform that's bothering you here? You say it doesn't sound too bad but you're obviously still concerned about how it's appearing. I was able to record all of my voice-over tracks for my various IVR systems. This morning I need to listen to them all and pick the best ones. Then I am going to set up an account with AudioJungle and get some music for a soundbed on some of my IVRs. It *appears* that I can use a MACBOOK ==> ONYX ==> SM7B/NT2-A configuration for now and be okay. So, until I can get a replacement Cloudlifter or a a more sophisticated audio interface with a beefier preamp, I guess what I have will do for my basic needs. Would you all agree at this point that my Cloudlifter did indeed die? Sam Inglis wrote: Having said that, there's no guarantee that you'll prefer the results from the NT2A for voiceover -- the SM7B is a classic mic for this sort of application and can be used up close, which will help to minimise the amount of room sound that gets captured. Funny you mention that, because I hung up my NT2-A after a few test runs last night, and ended up finishing out my voiceovers using my SM7B! Once I either go back to my PortaBooth Pro (or set up a similar, smaller encasement with my Auralex foam), maybe I will have better luck with my NT2-A, but I honestly preferred how my SM7B sounds. I think if I had a deeper, richer, more "manly" sounding voice, then the NT2-A would be a better choice, but I like how I can get right up on the SM7B and get consistent results. And, yes, I think the SM7B will be much easier to work with in my hotel room. On a side-note, I must say that I was surprised that I got as good of results with both mics as I did hand-holding them?! The good news is that I ordered a hopefully better broadcast arm (Rode) last night from B&H and should have it by next Friday, so that will help a lot! Do you mean 60Hz mains hum? If you hear mains hum you have a cable problem as you should normally just hear the background sounds of the room and maybe just a little hiss from the preamp. I probably used the wrong adjective, and, no, I don't think I have a cable or setup problem with all of my experimenting and swapping things out and simplifying things. If I crank up the Gain to past 60 on the outside scale (i.e. +45dB on the inside scale), then I don't hear a hum per say, but it just sounds like "life on steroids"?! I mean because the microphone sensitivity is so high, you can hear EVERYTHING in the Universe! Like I heard a loud cracking and realized it was the saliva in my mouth slapping around?! I guess it is "white noise" and NOT a "hum", if that helps? James Perrett wrote: I would also suggest setting your gain to give you the right voice level and ignore the background noise - it will still be at the same level relative to the voice with the gain turned down but you could be adding more noise from the later stages of your interface. So to repeat, it is better to get a stronger voice signal knowing there could be some minimal background/white noise, and then potentially edit that out later versus having no noticeable background/white noise in the recording, but then when I "amp it up" that could introduce new distortion that is worse than what you are proposing?? BTW... All things considered, I think I have a pretty decent recording environment. Once I can get my webserver set up and post things for you all to listen to, then I might find out differently. But normally my room is pretty quiet, and once I get this pre-amp/broadcast arm/foam around mic/ etc figured out, I think I will have a good environment for my needs. Of course I am a newbie, so what do I know?! maybe I will have better luck with my NT2-A, but I honestly preferred how my SM7B sounds. You aren’t the only one. I wouldn’t touch the NT2A with a pole. The 7B sounds way better. CS70 wrote: You aren’t the only one. I wouldn’t touch the NT2A with a pole. The 7B sounds way better. Hurrah! 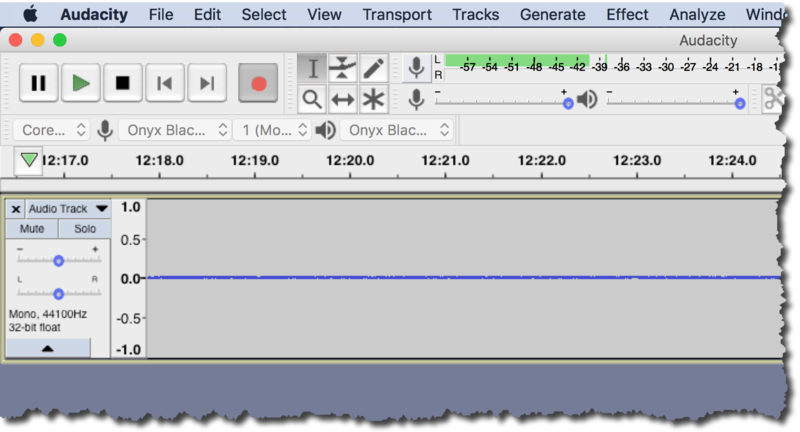 Getting somewhere -- although the signal flow is actually, SM7 => Onyx => MacBook, of course.. While it is possible for the cloudlifter to fail, it's not very likely - they are pretty robust devices generally. I'd want to check the XLR cables and phantom power thoroughly before condemning it as faulty. I remain to be convinced. It's possible, of course, but it's much more likely that you have one or more broken XLR cables. Your mention of hum suggests to me that at least one of your cables has a broken screen connection. That would result in hum with the SM7, and no phantom power reaching the cloud lifter or NT2. I'm a computer guy, so I think the other way, but yeah! I have 4 XLR cables all with less than 5 hours on them. Replaced the ones that were on the rig when things failed. Tried the new cables and had the same issue. Also, if my audio interface was bad, then my NT2-A condenser mic wouldn't have worked, right? When I got out my NT2-A, I plugged it in with phantom off, and it didn't work. Then I turned on the phantom power and it did work, although the signal is week. If I hook up the Cloudlifter, I get the issues I described earlier. Seems like all roads are pointing to the Cloudlifter, although I don't have any tools to test. Hugh Robjohns wrote: I remain to be convinced. It's possible, of course, but it's much more likely that you have one or more broken XLR cables. Your mention of hum suggests to me that at least one of your cables has a broken screen connection. That would result in hum with the SM7, and no phantom power reaching the cloud lifter or NT2. Just placed an order with B&H, but maybe next time? BTW, I ordered a replacement Cloudlifter, so if I get the same issue with the new one, I'd say that points to another component. If it fixes the issue, then it is likely the Cloudlifter.